Whilst my pre-vegan tastes leaned further towards a big block of cheddar or a tub of Philadelphia than anything decent there was a pizza place near me that used goats cheese on one of their pizzas. It was always my go-to order so this was an exciting one for me and the fact that I scoffed it all before it made it anywhere near a pizza says a lot about how delicious it was. The Double Cream Frawmage was just as delightful as I remembered and it inserted itself just as well into my morning toast feasts as it had on my oat cake extravaganzas up in Scotland. Lastly The Prodigy, Nutcrafter's grated almond parmesan, was a total surprise as I didn't even realise that Nutcrafter made a parmesan. 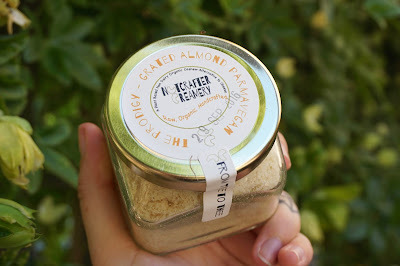 This nutty noochy powder is delicious over pasta or risotto and a jar of it would be the perfect addition to any festive foodie gift. 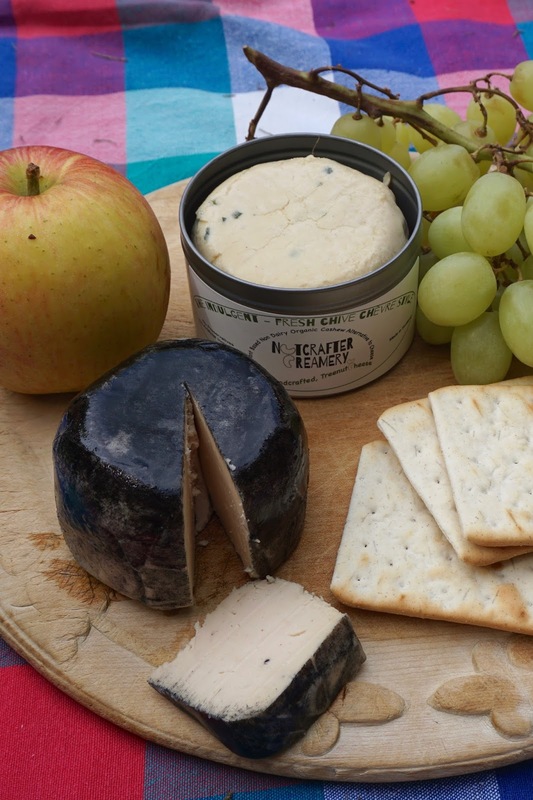 Nutcrafter Creamery cheeses are available at Infinity Foods in Brighton, Green Bay and Planet Organic in London, and at health food stores all over Scotland including Real Foods in Edinburgh and Roots, Fruits, and Flowers in Glasgow. Nut crafter Creamery also sell their cheeses online here. I think that these cheeses are an absolute must for any vegan in the UK who has spent time lusting after the huge range of artisan nut based cheeses on the other side of the pond or for anyone looking to fancy up their cheese board this winter. I obviously need to eat all of these cheeses again as soon as possible and I can't wait to try both The Rebellious, their air aged roasted garlic cheese, and The Ancient, an amazing sounding extra aged gomasio cheddar style cheese. Bring on the cheese plates! The cheeses featured in this post were provided free of charge for review purposes but as always all opinions are both totally unbiased and 100% my own. Ooooh, I love learning about new vegan cheeses. Hopefully, I'll get a chance to try these one day. I'm a vegan cheese fiend too! I hope you get to try these, The Volcanic is particularly exceptional. I've requested some of these cheesed for my birthday and am really excited but very apprehensive. Sorry! I've tasted a lot of vegan cheeses and they are frankly horrendous! I will report on my findings on my site. I REALLY want them to be nice! That's great, I really hope that you enjoy them. I totally understand the apprehension about vegan cheeses but these are cultured like dairy cheese just with nuts as the base so I'm pretty sure you'll love them. I'll keep an eye on your site for your review! how fun!! It's such an exciting time for vegan cheeses. I love that there are so many good ones out there in the world that I haven't even heard of! I always love cream cheese and parm substitutes. I know right? Supermarkets over here are even making their own vegan cheeses now! I love it! I am so excited by all the cheeses happening in the vegan world at the moment. I wish they could all come over to Australia though! These look particularly divine. Me too! I can't wait to come to AUS one day to see what kinds of exciting vegan cheeses y'all have going on. I'm stockpiling treats for our soon to happen holiday. We had a couple of their cheeses at New Year and loved them. I haven't tried any of the ones in your post though! I managed to pick up one of the Gomaiso's in Unicorn the other day for our trip and am desperately trying to resist opening it til we go away! I will be buying the gomasio as soon as I spot it, it sounds seriously good. How luscious! It kind of sounds like the UK equivalent to Miyoko's since they also create high-end nut cheeses, and even offer a black ash variety. Have you tasted both and can compare the two? I'd be very curious! I have tasted both and whilst I love Miyoko's cheeses for me the black ash by Nutcrafter is the winner. It's a little creamier and the ash is less intense which I preferred. These sound delicious! I wish we had such fun products available here. I have serious stuck in Australia envy! Do you have any nut cheeses over in Aus?